It’s just over 7 weeks to the SCVAC Road Race Champs, & as requested we’ve moved further west this year and so consequently the Bognor Prom 10k is a new Championship race for us. It’s a flat, fast, traffic free course with the promise of a great Start / Finish village. Hope you can join us? - & email me at Markchampion2012@googlemail.com to let me know you have done so. It would also be handy if you could enter using SCVAC as your club, but it’s not essential as long as you email me to let me know you’ve entered. Then on the day come and find me, I’ll be in the race village wearing a bright yellow SCVAC polo shirt. Following comments from members that recent races have been weighted too far to the east of our region this year's races have been spread a bit more widely. 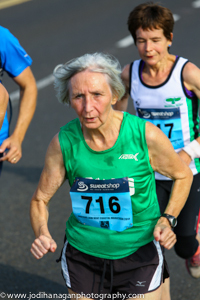 The Bognor Prom 10k is a race new to SCVAC, Burham Beeches half sees us returning to an old favourite, and for both the Dorking 10 mile and York Marathon we are teeming up BMAF for what promise to be exciting races. 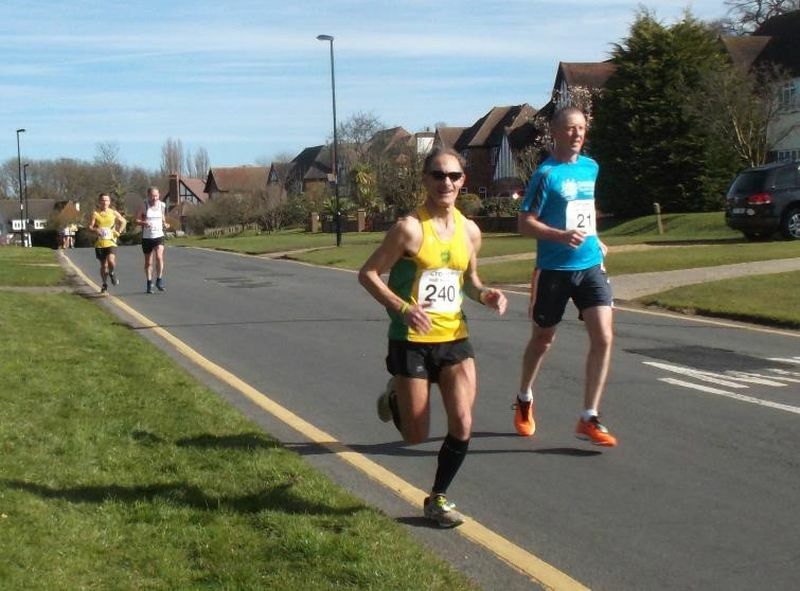 I'm hoping to tie up the few loose ends on the Bognor Prom 10k and Burham Beeches Half in the next couple of weeks, entries will then go live on Opentrack. Entry details for the Dorking 10 & York Marathon will also be on Open Track in the National Section. Look forward to seeing some of you out on the roads this year. I'm in the middle of putting together the SCVAC 2019 road race schedule and I have some news and I'd like your opinions. For the last two years SCVAC Marathon has teamed up with the BMAF Marathon at Chester. For 2019 the BMAF Marathon is moving to York and we have the option of having the SCVAC Marathon at York, or having our own race somewhere in our region. I'd be grateful of your thoughts. To date I haven't finalised these, I'm Kent based so know the Kent Road Race scene well, but I'm am keen to spread the races a bit wider this year so I'm looking for suggestions. Races need to be, easy to enter (won't sell out quickly), be well organised and mid-sized where the Race Organisers will be pleased to accommodate us soI can work with them to get fast accurate SCVAC results on the day. So any suggestions will be much appreciated. Finally, thanks to those who replied to my Facebook posts with race suggestions I've noted them and will be taking them into consideration. I do try and post SCVAC items on both the SCVAC & BMAF Facebook pages so if you are on Facebook please like both those sites so you'll see what I'm up to. Wishing you all a Merry Christmas and an injury free 2019. 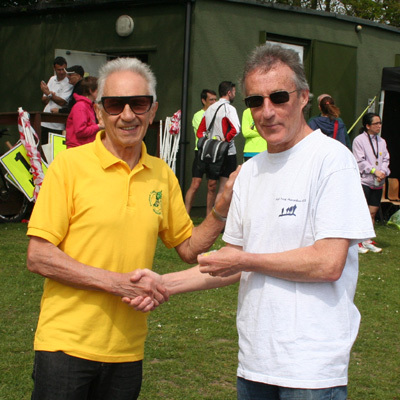 This year our 10k road championship was held within the Staplehurst 10k. The race organisers did an efficient job, and there was a friendly village feel to the event. We had one of our healthiest SCVAC entries in recent times, with 23 finishers including some newly enrolled members. The results team from Nice Work were prompt with our SCVAC results, and most winners stayed for the medal presentations. Mick Jefferies recorded these with a camera borrowed from Tony Rea, who was unfortunately unwell and could not attend. Some excellent performances saw 7 SCVAC members also winning their age category in the open race. I took the opportunity of running the course, setting off 3 minutes behind the field, and found it gently undulating, with one slightly more testing climb after 6k, all on pleasant country lanes. Clear signs and friendly marshalling, plus more than adequate water stations, ensured a good experience for all. The absence of changing facilities was not a problem given the pleasant weather. With total entries capped at 400, this is an ideal race for our club championship. 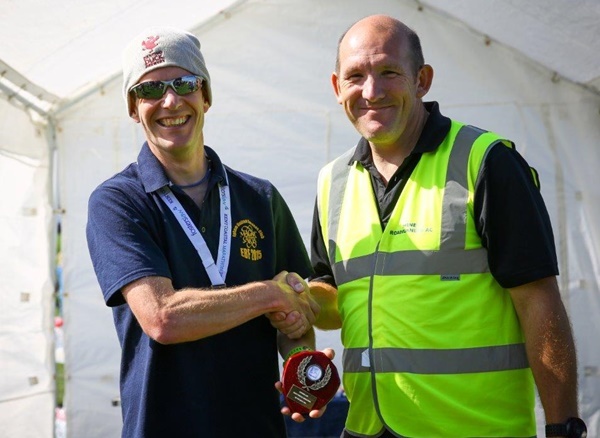 Apart from a few gaps in our age groups (no F40, M40, M45, or M65 runners), the turnout provided good medal competitions: the closest contest was for M70 bronze. Barry Bell prevailed over Mick Jefferies by 2 seconds on gun time, though Mick’s chip time was 5 seconds faster than Barry – stand nearer the front next year Mick! 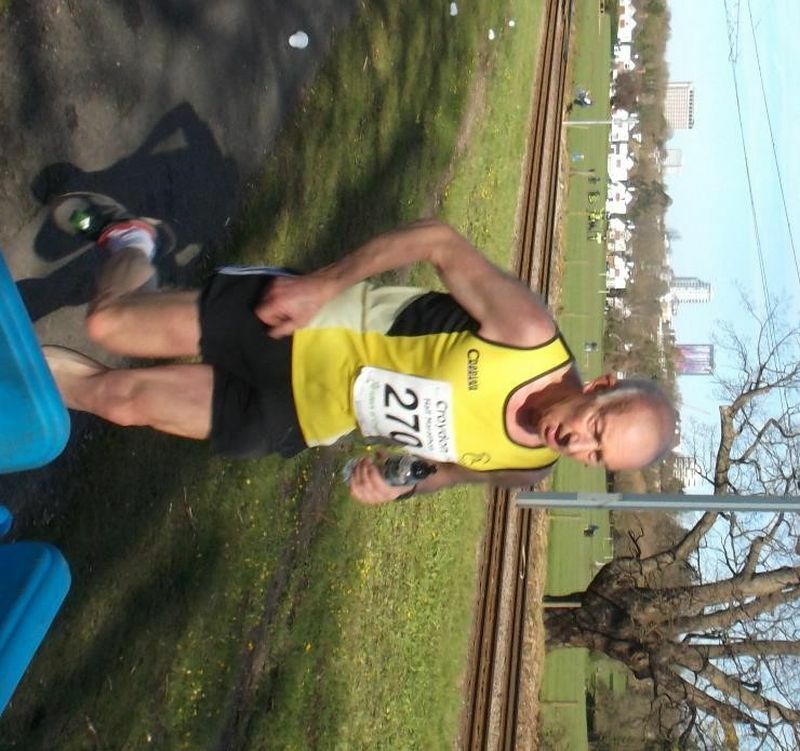 I’m delighted to report that Mick dipped under 50 minutes for the first time, so the PB made up for the missing bronze medal.While we were enjoying ourselves in Kent, Road Race Secretary Mark Champion was running the Yeovil Marathon in 3:12, a great effort Mark. 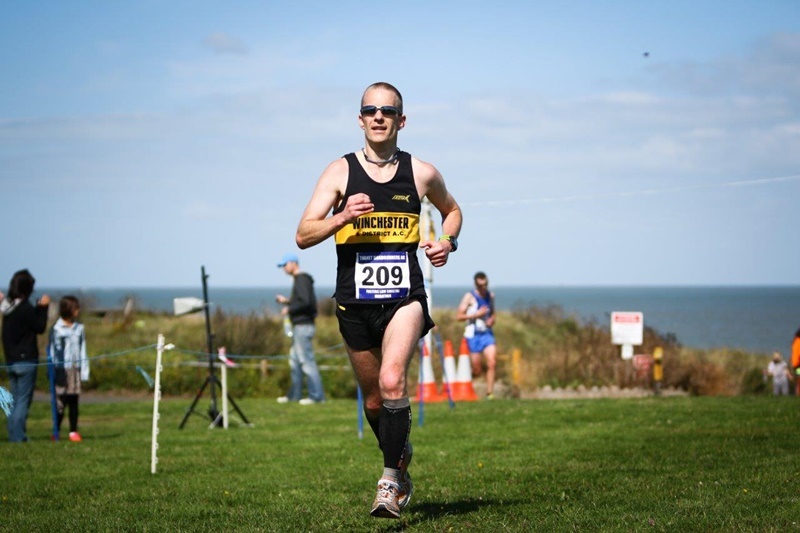 The Folkestone 10 took place on Good Friday - 30 March 2018, it was a day with much better conditions for racing than supporting as it was around 7 degrees and raining throughout the race, but there was little wind and some exceptional performances where achieved by the SCVAC runners. The first thing to say is that I was delighted by the support shown for yesterday’s race, we had 28 finishers yesterday and added to that I had two athletes drop out in the days leading up to the race (1 injury, 1 illness) and 2 no-shows, long may it continue. 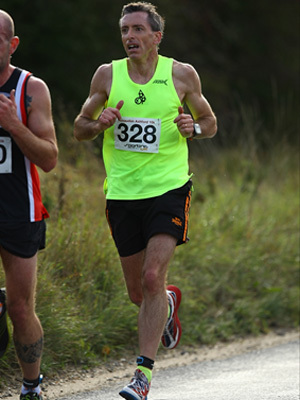 Andy Howey’s 16th place in the open race was the standout performance was he ran 58:43 as a V55 for an age grading of 87:62%. But further down in the results there were some other performances that were almost as good. 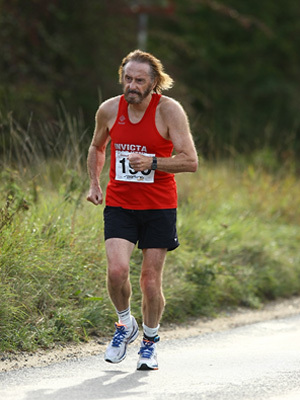 Tina Oldershaw ran 1:04 as a F50 for an age grading of 87:30% and David Winch ran 1:09:47 as a M70 for an age grading performance of 87:25%. Overall we had 6 results with age gradings of over 80%, and a further 18 over 70% so a fantastic standard. Finally a bit of housekeeping. Whenever possible please use the opentrack race entry system, this makes it really easy to track who has entered, and for all competitors to see who is racing, but if you’ve entered by the organisers entry system please let me know prior to the SCVAC close date so I can have a final entry list prior to the race. If you’re racing for us please come and see me before the start of the race to pick up your age cat number (to wear to wear on the back of your vest), this we way your competitors can tell who they’re racing, it makes it easier for me to know who is actually racing on the day & it also gets SCVAC’s name seen. I’ll be wearing a bright yellow SCVAC polo shirt. I’m pleased to say that we’ll be returning to Caterham this year. We successfully held our Half Marathon Champs there last year. So this year BMAF have included it as their Half Marathon Championship. We’re also returning to the Chetser Marathon. We’re aware it’s not in the region, but it’s the BMAF Champs & last year we had the biggest SCVAC entry in the Marathon Champs for a number of years, so we’d like to repeat that success this year. Entry for Folkestone 10, & Staplehurst 10k will be open on BMAF website shortly. Entries for the Caterham Half are already open on the BMAF website (enter for the BMAF Champs and you will automatically be entered in the SCVAC Champs). Special Instructions for entry into Chester Marathon can also be found on the BMAF website. Finally if you’ve already entered either Folkestone or Staplehurst via other entry channels let me know and I’ll make sure your included in the SCVAC Champs. I look forward to meeting some of you at our races during the year. 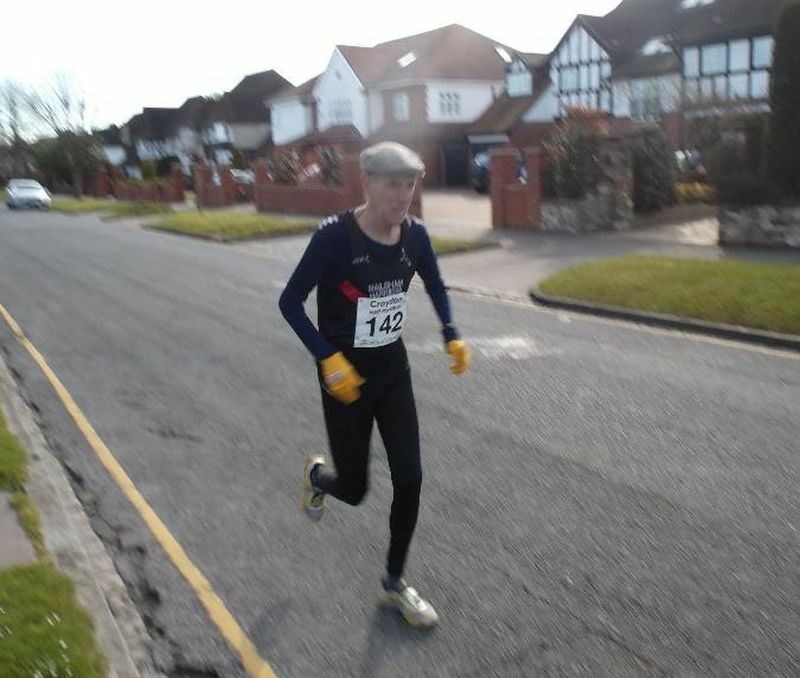 On the 4th December the SCVAC 10 Mile Championship was held as part of the Alan Green Memorial 10 mile race in Thanet. It’s a flat, traffic free out and back course meaning that fast times are possible as long as the wind stays away. On the day it was dry and overcast but we did have a reasonable tail wind on the 1st half and headwind on the 2nd half meaning that most runners were a couple of minutes slower in the 2nd half. 16 Athletes took part across 11 age categories. The most keenly contested were the M65 where Trevor Edgley won comfortably, but Peter Watts took a close silver just 45 seconds ahead of Barry Bell in bronze, and the W55 was even closer with all three medallists finishing within 4 minutes. 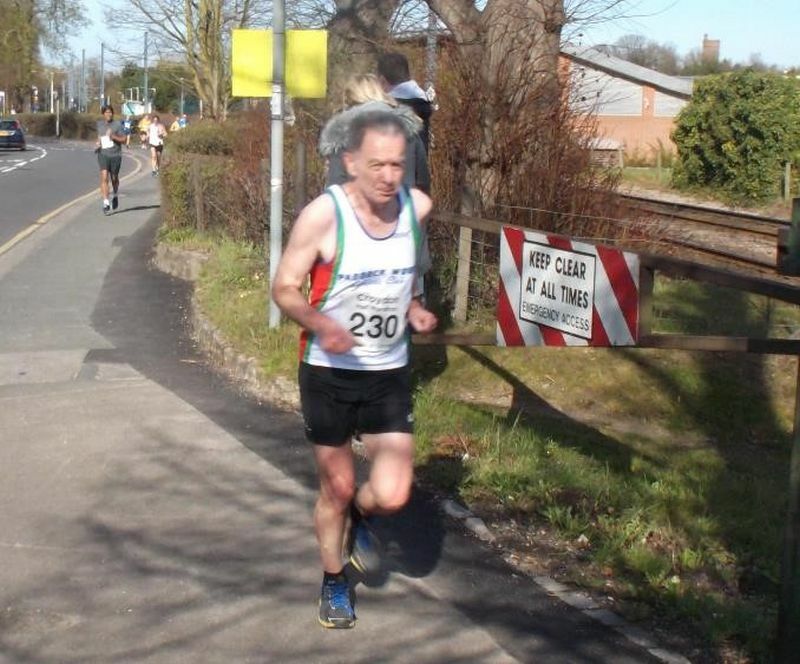 The Chester Marathon this year also included the BMAF and Home International Masters Championships, which provided a top-quality masters field, and the largest SCVAC Marathon Championship entry for some years. The race started in perfect conditions for marathon running: no wind and temperature in the low teens. The first 2 miles was a tour around the narrow twisting streets of old Chester, before going out to the country lanes of England and 9 miles in Wales. The closed roads gave a traffic-free race with good crowd support. In the villages the race passed through it seemed as if the whole village turned out to cheer and give support, and most pubs had a band playing to add to the good feel of the race. When I got to 20 miles, the weather started to change. It got colder and light rain came down - not much of a problem for the runners but uncomfortable for friends and family watching. After a tricky hill between 24 and 25 miles, it was an easy run in to the finish at the race course. SCVAC runners put in some very good performances with 9 picking up BMAF medals. The stand-out age grades were Dave Winch (M70 on 84.8%), Sarah Gruber (W40 on 79.4%) and Sarah Marizaioli (W65 on 78.7%). Unfortunately, due to the size of the race, most runners had gone home by the time the BMAF and SCVAC results were available so the medal presentation was poorly supported. 1. At the AGM, we drew names for the SCVAC club entry in the London Marathon 2017: Ann Bath was the lucky winner – congratulations Ann, and good luck with your training. 2. I omitted Bob Fursey from the results of the Ashford 10k. My apologies to Bob, who was our 5th finisher and 2nd M50. His name is included in my amended report. In total 17 SCVAC runners completed the race, which was a good turnout. 3. I am handing over road running duties to Mark Champion at the end of this year. Mark, an excellent runner himself, will be helped by Trevor Edgley. I know he will do an excellent job, and will work in the interests of SCVAC athletes. Please give Mark the same support and goodwill that you have given me during the last few years. 4. 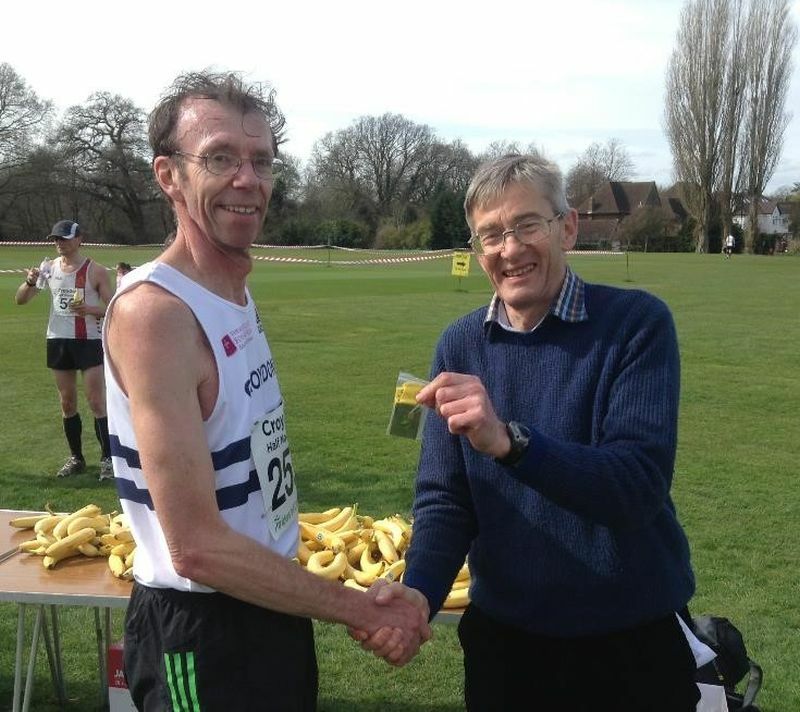 At the AGM we agreed that the multi terrain Ted Pepper Memorial 10k will be the responsibility of the Cross Country Secretary from now on, so Jeremy Carmichael will be looking after this event, staged on the early May Bank Holiday in Norman Park. Season’s Greetings, and good running in 2017! Race Director Barry Hopkins and his Sporting Events team laid on an immaculately organised race, despite this popular fixture being a sell-out, with no entries possible on the day. Some unexpectedly heavy showers caused a few puddles around the course, but conditions were good for running – cool with a few light showers. First man home for SCVAC was Dominic O’Mahoney, third in the open race, and only edged out of second place by one second. Dominic, who achieved an 87.88% age graded performance, took home the trophy for 1st M40 in the open race. Other excellent performances were recorded by M45 Mark Champion, M55 Kevin Williams, and M75 Dave Moorekite, who all exceeded 83% age graded. 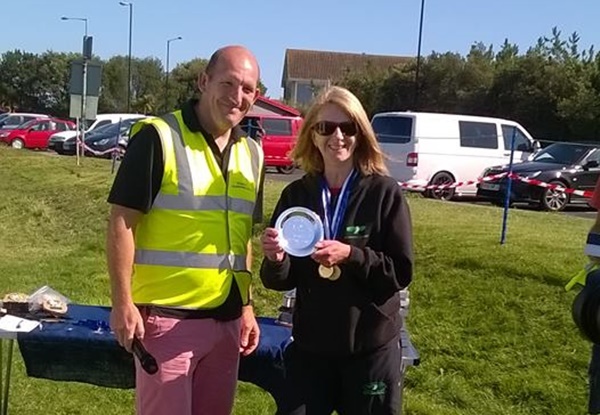 For the women, Ann Buckett was our first finisher – her husband Dave, who is the Chairman of Crawley A.C., kindly presented our medals at the SCVAC presentations. Full times and positions for SCVAC finishers are listed below. 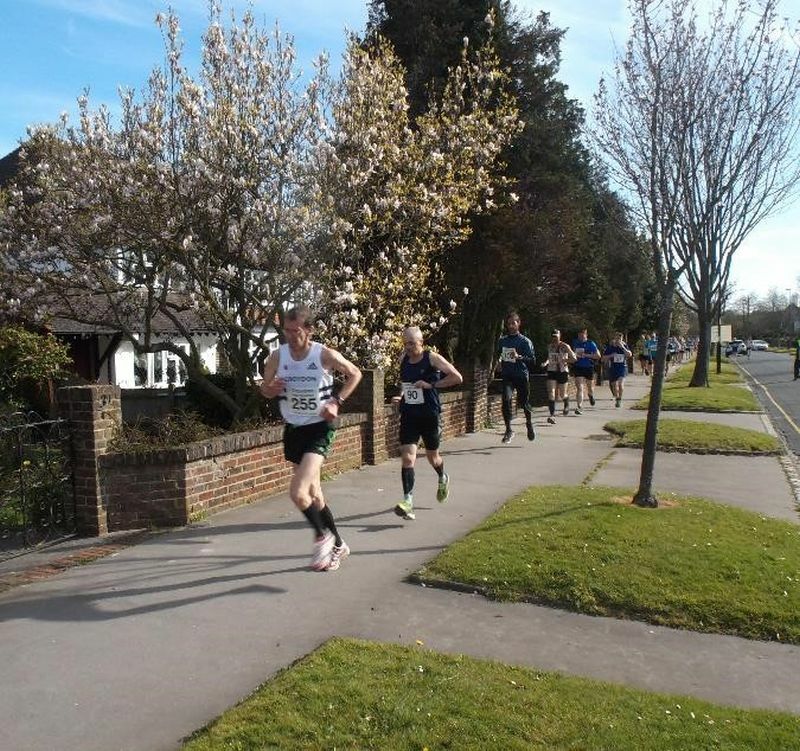 The SCVAC multi-terrain 10k championship was staged within this race, where athletic club members always outnumber unattached runners – a rare occurrence these days. A new sight was a large group of “Zero to Hero” runners in matching kit, who held their own presentation after the race. Blackheath and Bromley provided their usual high standard of organisation, with plenty of course markings and marshals at key points. After a good few years of service, Andy Tucker is stepping aside as race director and handing the reins to Dave Beadle for next year. We are confident the race will continue to provide its unique atmosphere and charm. The course was dry and fast, with a few small puddles to negotiate in the wooded section, but the mix of track, tarmac, grass, dirt track, wood chips and the occasional tree root to negotiate kept the runners focussed, and the kilometre markers appeared with welcome regularity. Rhys Goddard of Nene Valley Harriers set a cracking pace from the gun. 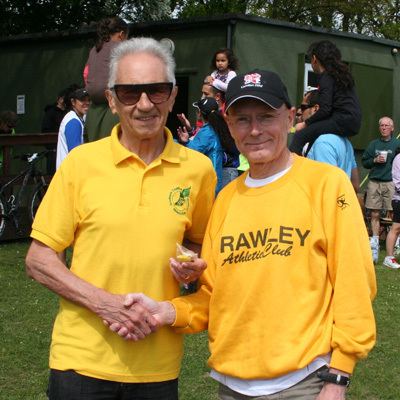 His time of 35:24 was over a minute clear of David Sparshott of Kent AC, with M50 Tony Tuohy of Dulwich a fine third in 37:13. 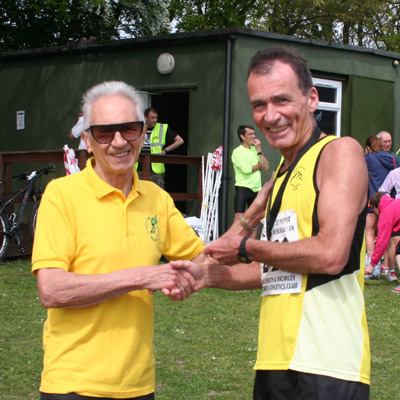 First SCVAC runner – and also our best age graded performer – was M50 Dean Angell of Horsham Joggers. His time of 38:23 would have been much faster on a flat road course, making his age grade of 82.64% even more impressive. 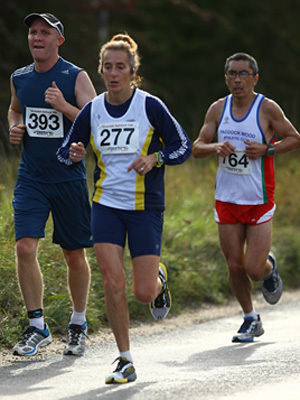 Next home was M50 Mark Pitcairn-Knowles of Tonbridge, and our third finisher was W40 Vikki Clark of Arena 80 AC. 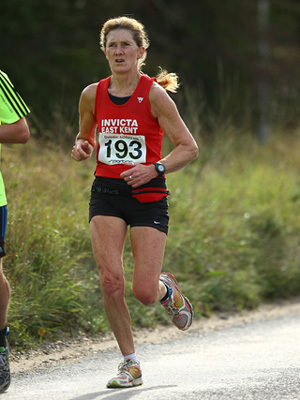 W55 Vicky Talbot-Rosner of Invicta East Kent AC was our second best age graded performer with an excellent 81.86%. Out of a total of 308 finishers, SCVAC provided just 12. 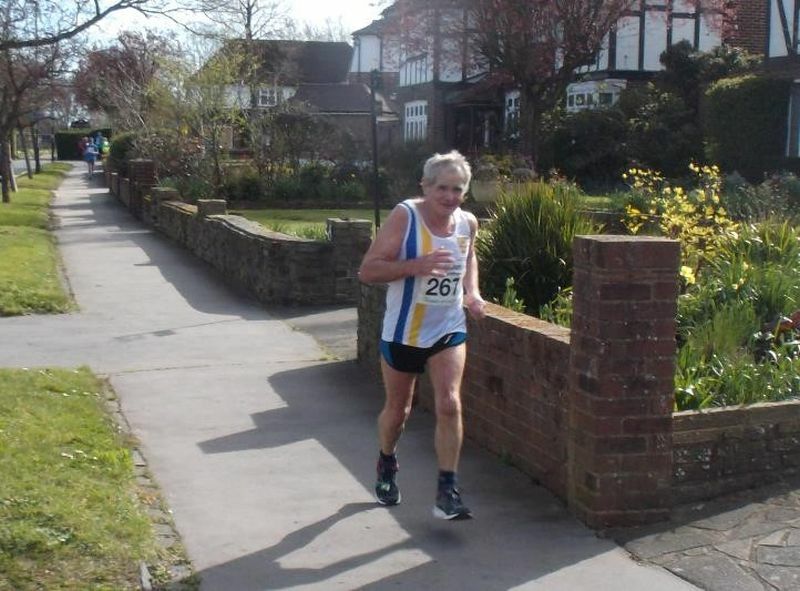 The lower numbers were largely due to the London Marathon one week previously, with regulars like Colin Oxlade and Walter Hill recovering from their efforts over 26.2 miles. In most categories, there were “easy” medals to be won. 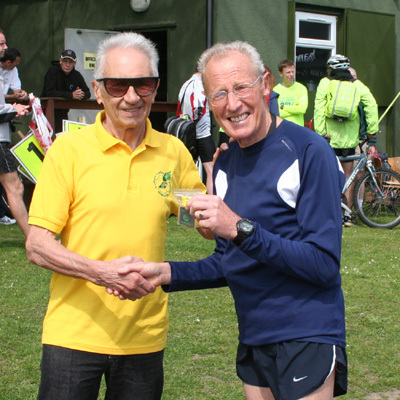 Only the M65 group saw 3 finishers – so all 12 runners went home with a medal, presented by our chairman Arthur Kimber. Other club members please note for 2017 – we would welcome more competition for medals! Full SCVAC results below. 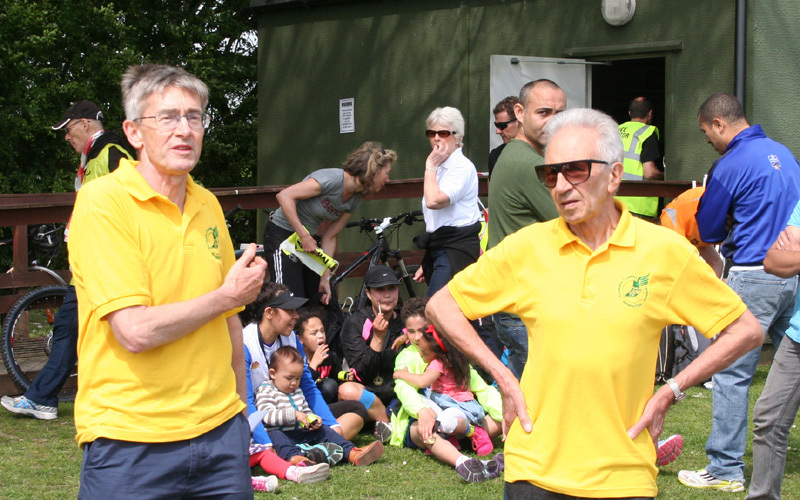 Striders of Croydon hosted our 2016 championship, and race organisers Nice Work ensured things ran smoothly. After an overnight frost, the conditions were perfect for running by the start time of 9.15am. The runners were led out of the sports field and down the road to the start, and a blast on the horn sent them on their way. The early leader, Peter Mills of Croydon Striders, was joined by 3 others, and this group stuck together for the first few miles. The challenging two lap course included some long hills, which were decisive in breaking up the pack. 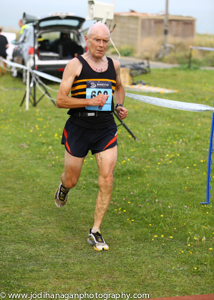 By the halfway point, Michael Eccles of Norfolk Gazelles had the lead, which he held to the finish. His time of 1:14:15 reflected the tough course, and he was over a minute clear of Peter Mills. 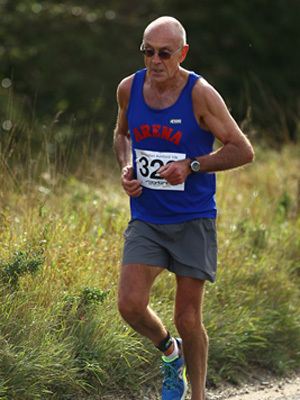 First SCVAC runner was M35 Alan Sylvester of Arena 80, 5th in the open race in an excellent 1:20:50. 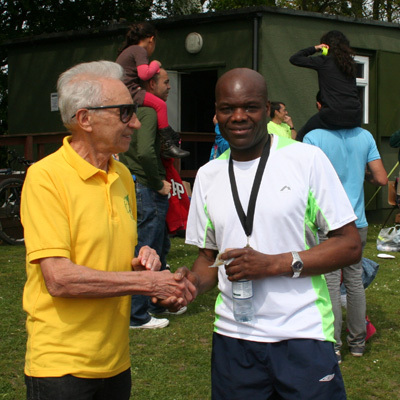 Special mention goes to M60 Neville Webb of Dulwich, who achieved our best age rated performance. With the two main Spring marathons imminent, race numbers were low: only 261 finishers, and there were no SCVAC women. Colin Oxlade used the race as a final long run before London, including a thorough warm up and warm down. 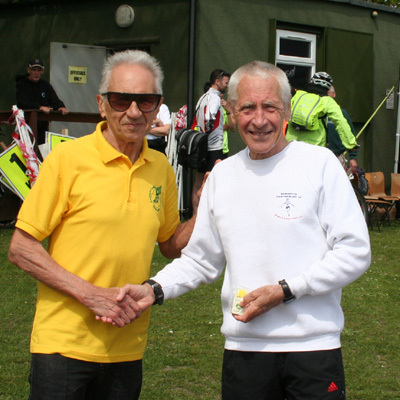 He held off Steve Smith to take gold in the M55 age group. Full SCVAC results below. I have tried to avoid clashes with BMAF events, and have chosen Spring or Autumn races to avoid the hottest weather. Our championships were well supported by the older age groups in 2015 – let’s encourage more of our younger members to join us in 2016. This multi-terrain race starts and finishes on Norman Park athletics track, attracts good club competition, and has free parking, showers, and refreshments on sale. To enter pay attached runner fee plus £1 for SCVAC championship. Striders of Croydon host this race, organised this year by Nice Work. Please note parking is very limited, public transport links are excellent, and the race HQ at the Sandilands club house is only 10 minutes’ walk from Sandilands tram stop (2 stops from East Croydon station). Changing, showers, refreshments and bar. An undulating two lap course starting and finishing close to Lloyd Park. Entry form can be downloaded from Nice Work website: http://www.nice-work.org.uk/events.php?id=206 . Please use the link “An entry form is available to download here”, and ignore all the other online options (e.g. Runners World), which do not include fields for entering the SCVAC Championship. 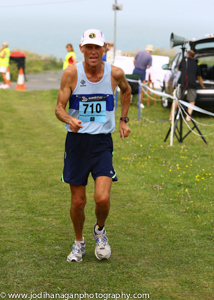 Kent Coastal Marathon, Thanet, Kent September 4th, Start 9.30am. We return to this popular event hosted by Thanet Roadrunners. It offers a coastal route and scenic views, with a lively Start / Finish area. Free parking, refreshments, changing, but no showers. Entry to the SCVAC championship will be via BMAF OpenTrack system, details to be published later. Givaudan Ashford 10k, October 9th Start 10am. This highly rated race features totally closed roads through the town centre, an interesting undulating course, changing, showers, refreshments, free parking, chip timing, good organisation. Epsom 10, November 20th Start 9.30am. After two years away, we return to this traditional club runners’ race, which also hosts the Vets AC champs. The route is a single undulating loop on country roads around Epsom and Walton Downs. Changing, showers, free parking, refreshments. Race HQ: Queen Elizabeth Grandstand, Epsom Downs Racecourse, KT18 5LQ. Entry to SCVAC championship via Epsom and Ewell website – download entry form and pay attached runner fee plus £2 to enter SCVAC championship. Good Luck with your training and racing! 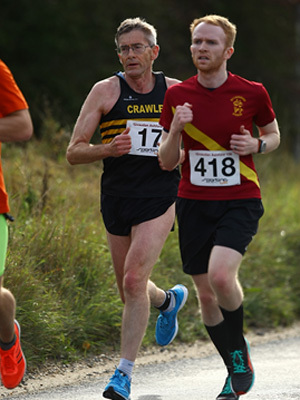 Our club 10k championship was held within this race, and some excellent performances were recorded on a fairly challenging, undulating course. Conditions were nearly ideal, apart from a slight cool easterly breeze. We had a really good turnout of 26 runners, of whom 25 finished. Unfortunately Lynn Champion was forced to retire with an injury. 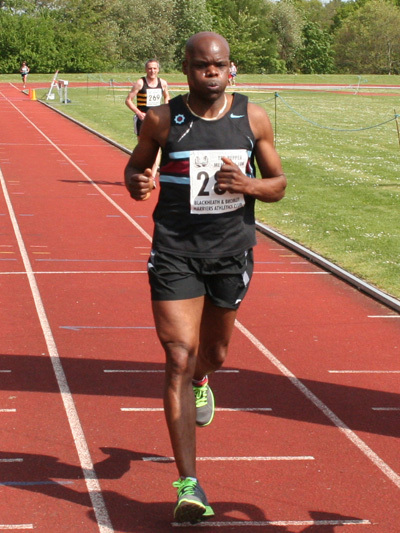 Husband Mark led home the Southern Veterans runners to take M45 gold. 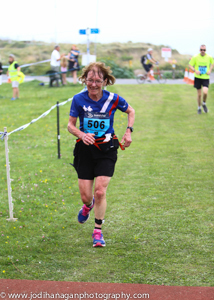 In the W45 race, Tina Oldershaw recorded our best age rated performance, and the second and third best age rated runs were achieved by M75 Dave Moorekite and M70 Michael Conway. After missing the race myself for a couple of years, it was a pleasure to take part again, and I was able to observe several of our members during the race. I cannot report on the efforts of the faster runners, they were “home and hosed” long before I made it back to the Julie Rose stadium! The event was well organised and well marshalled, and only a slight inaccuracy with the positions of the first 2 kilometre markers detracted from an otherwise faultless race. I propose we return next year for our 2016 championship. Full SCVAC results are listed below. Well done all who competed. Catherine Roberts (3rd woman overall and SCVAC gold medallist) around the half marathon point with a fellow Maidstone runner. The lower photo shows her receiving her award for 3rd place. 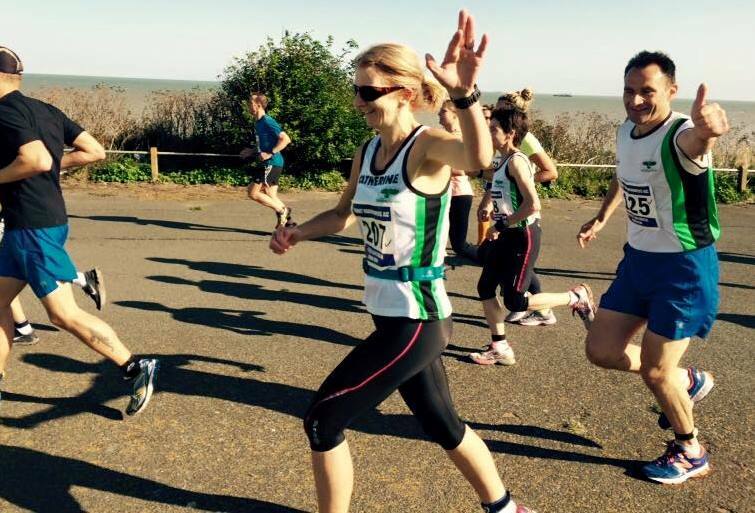 Nearly 200 runners lined up for the Kent Coastal Marathon this year. They experienced warm and sunny conditions with an early stiff breeze that prevented the erection of the start line gantry. 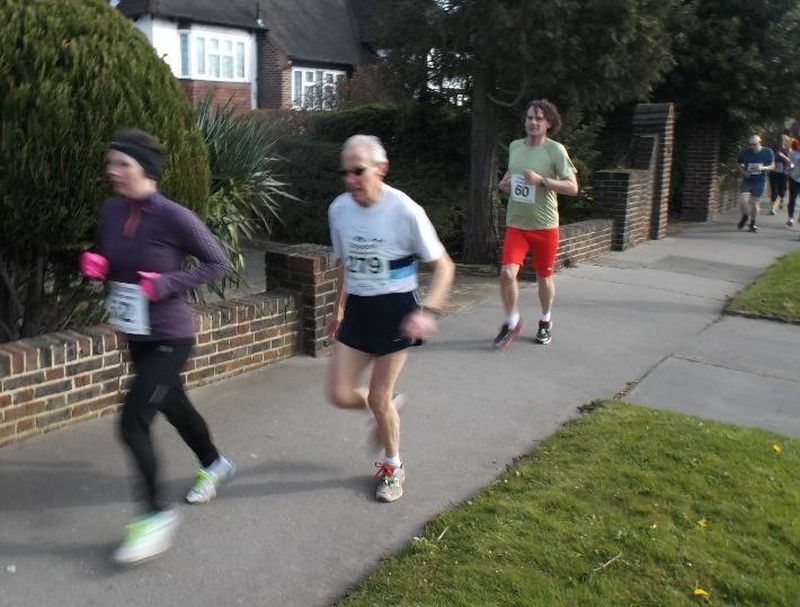 Later, calmer conditions ensured the Finish was erected without problems. SCVAC entries numbered 7 male and 2 female runners. Carol Emery of Paddock Wood had to retire at the half marathon point with sore feet from relatively new trainers. First SCVAC man home was Ian Berry of Winchester, 4th overall with a fine clocking below 3 hours. First SCVAC woman Catherine Roberts of Maidstone was 3rd woman overall. 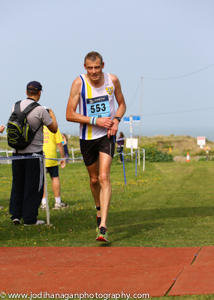 A personal report from Ian Berry, who was gold medal M40 and 4th in the overall Thanet Marathon. Photos from JODI HANAGAN PHOTOGRAPHY. 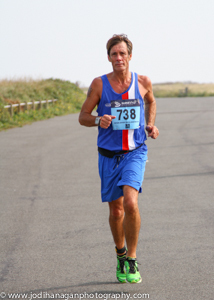 The Kent Coastal Marathon was something of a nemesis for me. I ran fairly well in the humid heat here last year and came home in a decent 3:02. At the time I was quite pleased, but since then I have finished thirteen road marathons in under-3 hours and not been over 3 hours since Kent. I entered this year’s event partly as I had a sub3 score to settle here, but also the attraction of a championship race appealed to me. Kent locals warned me that 2014 was one of the few years when the wind hadn’t been a major factor and I was to expect a breezy day on the coast! When I left Hampshire at 5am the weather seemed perfect – cold and not a breath of wind. When I arrived in Margate some 3 hours later I was met by flags held out against the stiff breeze and rising temperatures! Although a little troubled, I wasn’t altogether surprised as I had been warned. 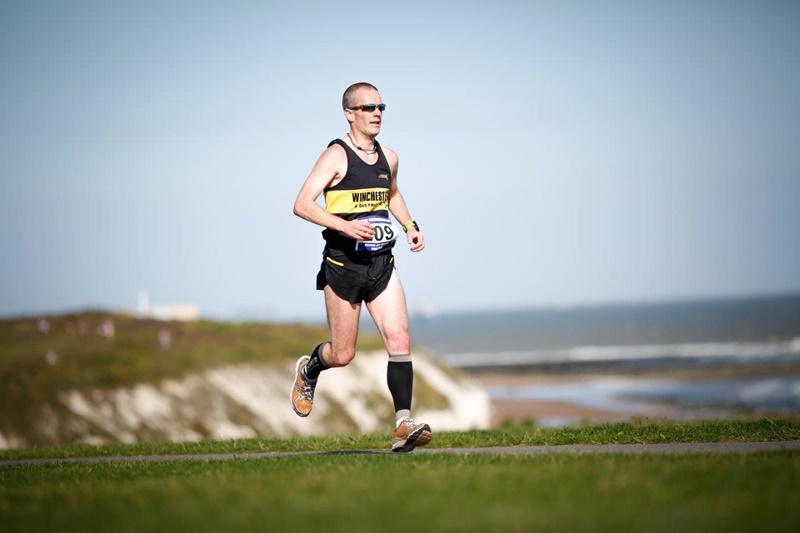 The course essentially goes south-east from Margate for 6.5 miles, you turn around and run the same route in a north-west direction to Margate (where the half-marathon finishes) then you run a further 6.5 miles west, turn again and make a final eastbound return to the finish. The significance of this is that I knew the wind (about 15 mph at the start) would be a significant advantage in the first and fourth quarters, but a real hindrance along the sea wall especially in the third quarter. My target was to use the tailwind in the first quarter to build a two minute cushion ahead of “even-pace”. That plan worked well, with plenty of half-marathoners and marathoners to run amongst and very pleasant encouraging marshals. Despite the undulations the course felt pretty easy with the assistance of the wind behind me! In the second quarter I passed a couple of guys to move into fifth, although I was somewhat disconcerted by a marshal wearing a “Lead Bike” tabard cycling just ahead for a few miles! I’d hung on to my cushion at the halfway point, but now without the company of half-marathoners and 6.5 miles of exposed concrete seawall ahead I knew that buffer would ebb away. The third quarter passed without drama – I was lucky to have a runner within sight to keep me keen. At the final turn-around I’d caught him and we agreed we’d both be under three hours if we kept things sensible in the final run in. By this time the wind had definitely receded and the last few miles seemed to have more undulations than I recall! My new friend and I certainly spurred one another along, trading places a few times as we took turns for one of us to tire and the other to surge ahead. I knew there were a couple of cheeky short sharp inclines in the last couple of miles so couldn’t really be sure of the sub3 until I could see the finish. I pretended to sprint for the line, securing fourth place, first MV40 and a finish of 2:56:50. Many people say to me that running so many sub3s in a year must mean each one is “easy”. Racing a marathon is never easy, and today was one of those days when it took a lot of experience and patience to run a successful strategy. I’m really proud to do the SCVAC Gold justice with a decent performance. Below are corrected results for the Ted Pepper Memorial 10km, with some incorrect “members” removed, and with age rated percentages taken from the Power of 10 website. The percentages reflect the multi terrain nature of the course. Michael Conway, Vicky Talbot Rosner, and Aaron Hughes achieved the top 3 ratings. Well done to all members who ran. Our final road championship of 2014 was hosted by Ashford A.C. at the Julie Rose Stadium, and was very successful. We had our highest turnout, with 23 runners providing some decent competition for the medals within several age groups. The conditions were perfect – 12 degrees with a gentle 7mph breeze. After dispensing age group numbers, I lined up for the start between SCVAC members Peter Godbee and Graham Williams. The start was delayed by 10 minutes due to the high number of entries on the day ( a common feature these days), and after a well-observed minute silence in memory of Derek Seamon, Ashford AC’s club president and former race organiser, around 900 runners left the stadium to join the traffic-free route around Ashford. There seemed to be more hills than I remembered! I spotted Steve Suttle, Martin Hawkins and Steve Barnfield ahead, but they soon left me behind. The accurate kilometre markers helped check my pace, and my 5k time of 21.37 meant that “43 something” was likely. Crawley clubmate Terry Barnes eased smoothly past me – we are both coming back after injuries – and the remaining kilometres passed swiftly. I saw Kim Howes of Larkfield ahead, but could not close the gap between us. The finish is enjoyable – encouraging shouts in the car park, louder cheering as we enter the track, and the announcer’s voice picking out runners as they make their final effort in the home straight. SCVAC members placed well in the open race – though it was disappointing there were only awards for Senior, V40, V50, and V60. Gavin Kitchingham (age 47) won the open M40 with our best age rated performance, and several others placed well in the open categories. 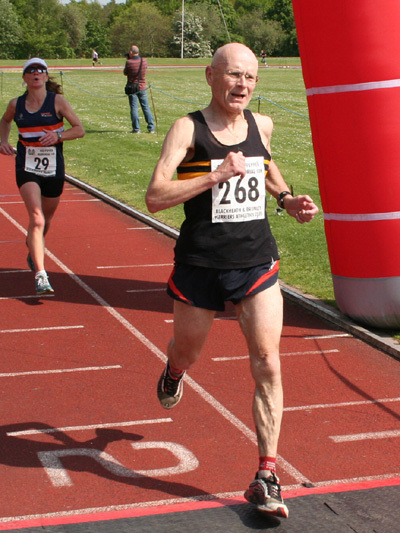 Michael Conway, aged 73, placed 12th in the M60 category, and was without doubt the fastest M70, if only there had been a trophy for that category. 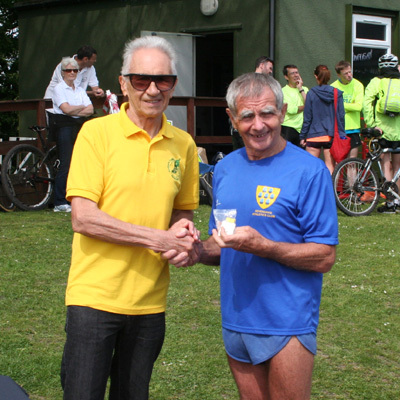 M60 Paul Gasson of Arena 80 AC receives his SCVAC gold medal from Dave Beattie after the Ashford 10k. Thanet Roadrunners organisation of this event was excellent – at the Race HQ, runners were efficiently processed through a taped off route of tables issuing race numbers, timing chips, age group numbers etc. Marshalls and feed stations were plentiful, and the enthusiastic announcer kept spectators entertained throughout the event. The marathon runners started with those running half the distance, and the winning half marathon time of 1:19 illustrates the hilly nature of the first half of our championship course. There is also a testing hill two miles from the finish, climbing from Margate seafront up onto the clifftop path. Most finish times were 8 or 9 minutes slower than the runner’s London Marathon result. BMAF runners dominated the open race: M40 Peter Dimbleby of Birchfield was 1st, and M50 Keith Dowson of Sevenoaks was 3rd. Walter Hill won the open prize for M60, and Barbara Ralph of Chiltern Harriers won F60, narrowly shading Keith and Walter for the best age graded performance by a Southern Counties Veterans AC member. 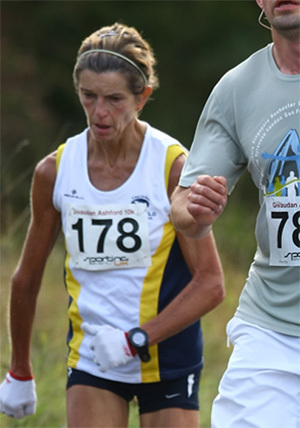 The best BMAF age graded score was 82.94%, by Ann Doherty of Forres Harriers, aged 69 who ran 4:19:39. SCVAC results in full: our members accounted for 50% of the BMAF finishers, and recorded some good performances in quite humid conditions for marathon running. Well done to you all – I enjoyed handing you your hard-won BMAF and SCVAC medals! 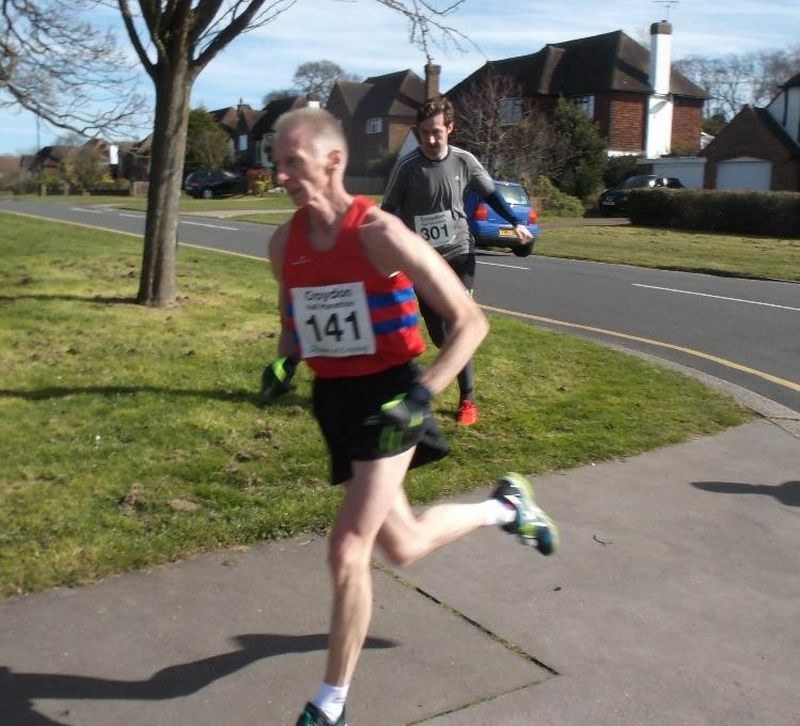 Burnham Joggers kindly hosted our half marathon championship this year, and as always, provided a well organised event featuring a challenging but pleasant traffic-free course, and good changing and shower facilities. In contrast to recent years, the runners enjoyed cool conditions on August 17th, and most finished before a sharp downpour sent spectators diving for cover. Entries in the open race were down on previous years – a shame, because the race needs to attract 800 or so to be economically viable. At the sharp end, Simon Newton of Barnsley took the honours in 1 hour 16 minutes, with M40 Eddie O’Gorman finishing a minute adrift. The ladies were led home by Sophie Carter in 1:20:31, 4 minutes ahead of F40 Liz Hartney. 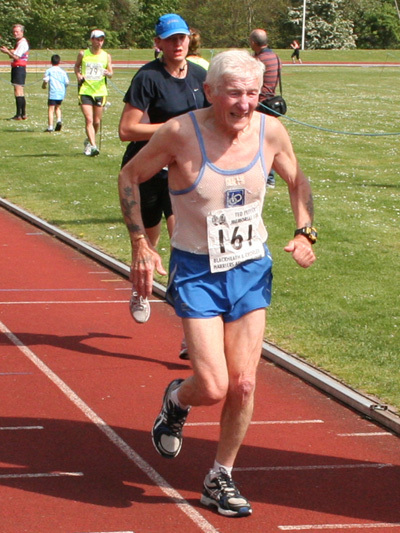 M60 Dave Cox of Woodford Green and Veterans AC ran an outstanding time of 1:21:05. SCVAC entries were also down, with injuries accounting for several absentees among our “regulars”. Eight members finished, their performances helped by the weather. Sadly, competition was lacking for the SCVAC medals – only one runner took home a silver medal, the rest won gold! I hope we see a better turnout for our remaining 2014 Road Championships: the Thanet Marathon on Sept 7th and the Givaudan Ashford 10k on October 12th. First SCVAC man home was M45 Mark Champion of Istead and Ifield in 1:24:08 – I clocked Mark at the halfway point, and he ran a swifter second half by a couple of minutes. F40 Heather Fitzmaurice was next across the line – her time of 1:33:45 won third prize in her age group in the open race: well run Heather. 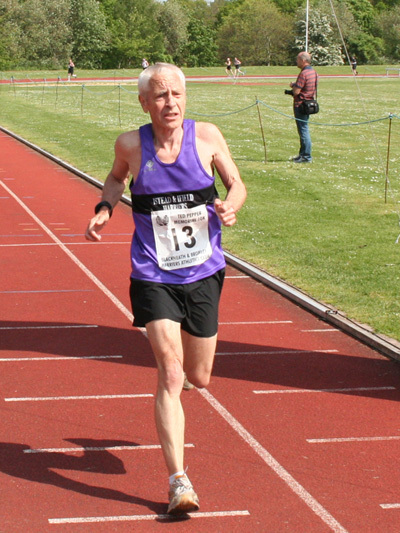 It was great to see Tony Brackstone, who has battled knee problems, return to take the M70 honours in the open race, in a new course record of 1:36:40. Tony achieved our best age rated performance of 84.46%. Many Thanks to Alan Watson and his enthusiastic band of helpers, who staged a great event – I particularly enjoyed watching a red kite circle above the school playing field while the runners below launched their final sprint for the finish! The full SCVAC results are set out below, with age rated percentages. 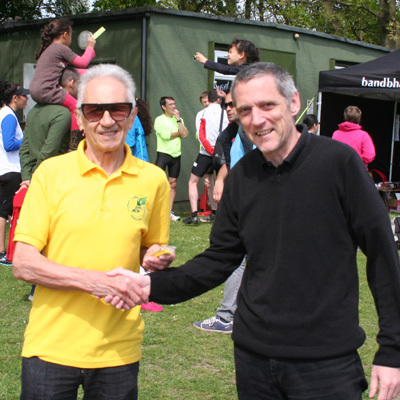 Blackheath and Bromley again hosted our multi terrain 10k Championship, on a beautiful Spring morning – bright sunshine with just a hint of a cooling breeze. With the British Masters 10k at Kings Lynn clashing with this fixture, SCVAC numbers were down on last year, but 12 members finished the race. The course is interesting and enjoyable, but not noted for fast times due to the grass and dirt sections. It starts and finishes on Norman Park Athletics Track, which is great for family and friends to spectate. 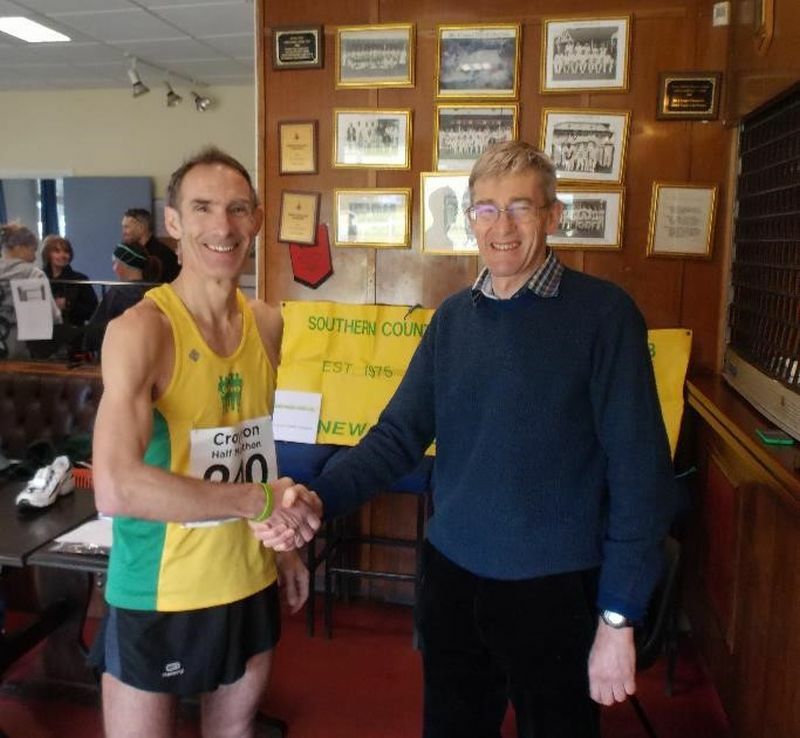 Fastest SCVAC runner, and recording our best age graded performance, was M65 Trevor Edgley, who managed to beat his Vets AC rival Mike Mann in his overall race age category. Walter Hill was not far behind Trevor, despite racing at Kings Lynn the previous day – a fine effort. The M60 category saw the best competition, with Peter Watts prevailing over Jeremy Carmichael for the silver medal. Chairman Arthur Kimber presented the medals, and all medal winners stayed to attend after a well organised and thoroughly enjoyable event. With useful “goodies” like running socks and a reasonable entry fee, this value for money race was full before race day. Enter early next year to avoid disappointment! Younger Age Groups and Women please note that medals are there to be won – only one lady, Karen Samuels (a loyal supporter of all SCVAC events) and no men under the age of 50, entered this great race. Thanks again to race director Andy Tucker and his hard working team – we’ll be back next year! The yellow SCVAC polo shirt is available to club members for £15, and is great for advertising the club and encouraging new members to join. Please contact our Chairman if you would like to buy one. 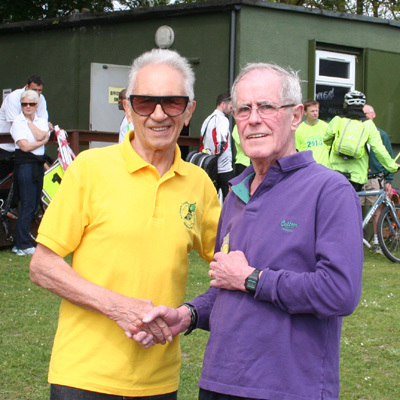 A nasty throat infection prevented me from attending the race, and I am grateful to Walter Hill for taking my place and presenting the medals. All who completed the race in tough cold and rainy conditions are to be applauded. In particular, Arena 80 A.C. sent 3 runners on a 200 mile round trip to compete – very successfully – in our championship. They thoroughly deserved their pub lunch at the hostelry they had spotted during the race! Walter Hill’s report is below. Thanks again Walter – I know that it took 10 minutes in your car with the heater and blower on full blast, to thaw out enough to present the medals, and you stayed longer than anyone to fulfil your role at the presentation. Congratulations to all SCVAC finishers at the Canterbury 10 mile SCVAC Championships. Yes it was windy,wet and cold and your times reflect determination and tenacity on what is regarded as a challenging course in the best of weather. 1st man home from the club was Mark Champion M 45 in a very respectable 1:00:15.Mark was placed 8th overall in a field of 598 finishers. 1st women home was Caroline Wood F 50 1:08:08 in another very solid SCVAC championship performance. Caroline was also first F 50 in the open race. One of the highlights of the day were the M 70’s who had 3 finishers and led to a close examination of the results before the medals were presented. On a personal note it was a delight to witness the outstanding Patrick Dobbs finishing on such a tough day. The e-mail below is self explanatory. What I need to do is to ensure that members are aware of its cancellation. Personably I would have booked a flight to ensure the best price now.Others members may be thinking of doing the same. Chris would you be so kind to post the cancellation of the Moray Marathon on the BMAF web site as soon as possible. Can I also ask for the the cancellation to be posted on as many affiliated club websites as possible.Priorities web sites due to location are SCVAC, VETS AC, SWVAC, EVAC, MMAC and Welsh Masters .If we are quick I am confident we will avoid embarrassment. Fortunately I was cautions enough to allocate provisional against the fixture on the website so I hope none of our members have purchased flight tickets yet. I aim to find a replacement Marathon for 2014 as soon as possible. Unfortunately, following a meeting on Wednesday 29th January 2014, it was agreed to dissolve the Moray Marathon committee and therefore last year’s event was the final Moray Marathon. I sincerely apologise for any inconvenience this may cause you and your colleagues. We were really hoping the event would continue with some new members, but disappointingly this was not the case. 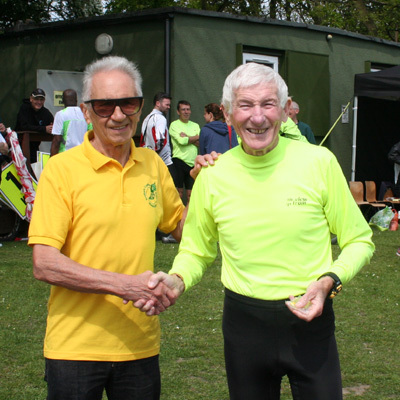 This was the 50th anniversary of the Epsom 10, and our thanks to Epsom and Ewell, and race director Dave Clarke, who hosted our 10 mile championship. Southern Veterans A.C. had an improved attendance compared to recent years. The runners praised the event afterwards, particularly the many helpful and encouraging marshalls: this is not a PB course, but provides great racing in great surroundings. Race HQ is within the Queen Elizabeth Grandstand, and the runners enjoy the use of the jockeys’ changing rooms and showers. SCVAC member Steve Winder, a local resident, managed to finish 1st overall, and was the only runner to dip inside one hour for the challenging course. His age graded performance of 81.26% represented a new best mark for him. 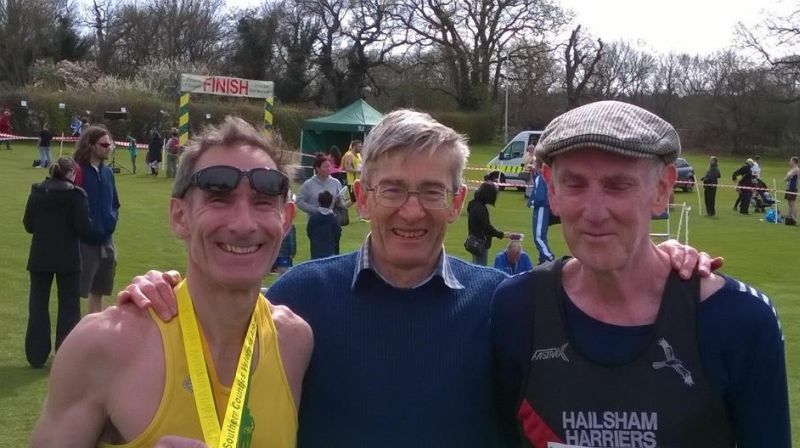 Three other SCVAC competitors performed well despite having raced the British Masters marathon at Newcastle only three weeks before: Dave Worcester repeated his gold medal performance in the M60 contest, with Walter Hill improving from BMAF bronze to SCVAC silver at Epsom. 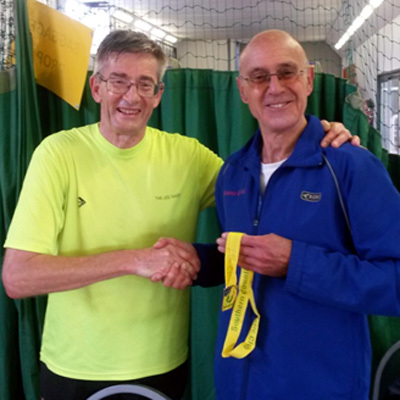 Trevor Edgley added an M65 gold medal to his BMAF marathon gold. The top SCVAC age graded percentage score was recorded by Geoff Newton with 83.99%. 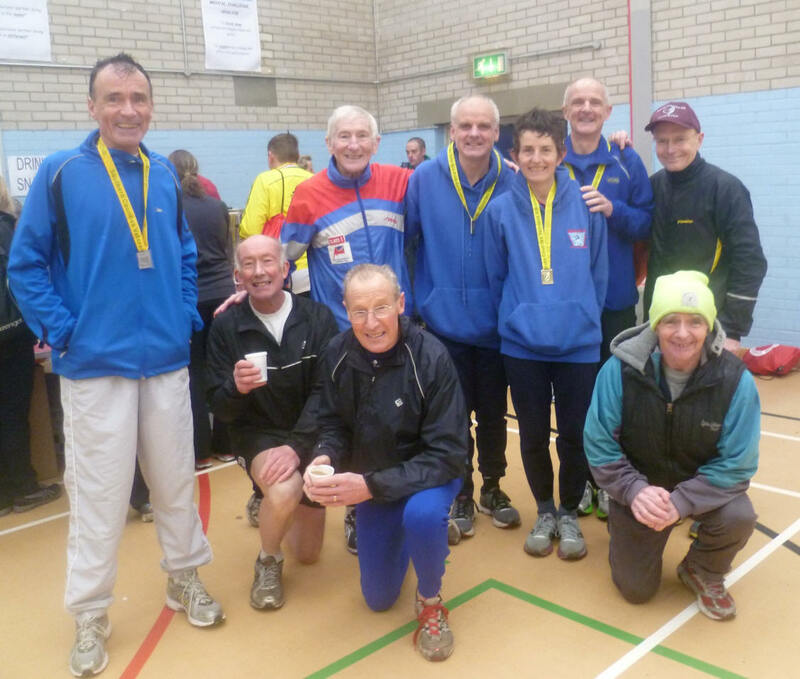 Overall there was a decent Southern Counties Veterans turnout, but disappointingly few in the younger age ranks, and only two female members – though Ann Bath is to be commended for she had competed in the Home International cross country at Cardiff on the previous day. Dave Beattie, Road Running Secretary.